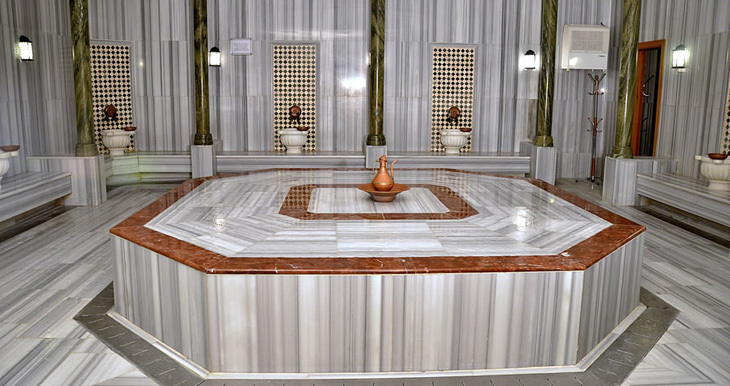 In Afyon, all spa journeys start with a soak in the thermal water. Mine began in one of the deluxe private hammam suites at the Aliva Spa, Gural Afyon (Deluxe Family Turkish Bath Suite: 60 minutes, £30). The bath is big enough for about four or five people and has a Jacuzzi function (which we did not see elsewhere in Afyon). Hatice, my hammam therapist, collected me from the suite for The Sultan’s Bath Experience (30 minutes, £35). 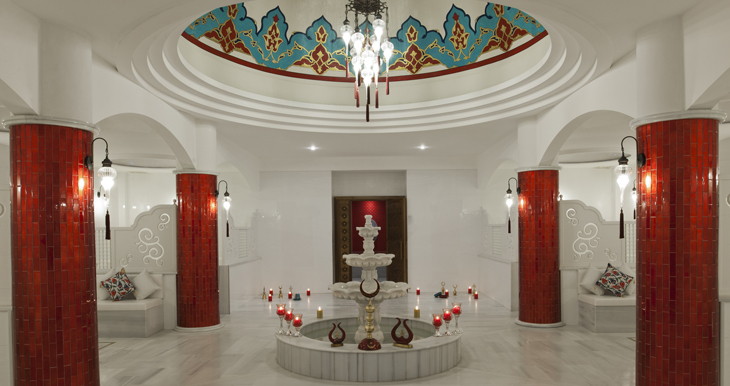 Wrapped in a towel, I walked through the spa to a beautiful white marble hammam. Hatice asked me to peel down my swimming costume to low knickers level. She spread a peshtamel (Turkish sarong) across the heated marble platform and rolled up a second as a pillow. I lay face down on the white marble stone and Hatice briefly disappeared to change. Another woman was having a treatment across the hammam, and the sound of drips and echoes filled the steamy room. Hatice returned wearing a swimming costume and rubber pumps. Therapists perform all hammam treatments in Afyon in their swimwear. Hatice used a large silver bowl to gently pour water over each part of my body. Next, she quite vigorously scrubbed every inch of skin with a traditional kessa glove, which is slightly abrasive and removes dead skin. The washing part of the ritual follows. The hammam therapist dips a large white cheesecloth bag into a bowl of extremely soapy water. Each therapist has a different technique to produce copious amounts of suds; Hatice blew into the bag like a balloon. Once it was full of air, she squeezed it over me to wring out the soapy bubbles. She repeated this until I was completely covered. Hatice massaged the suds into every part of my body. This is both a cleansing and massage treatment. Foam covered and surrounded us. Hatice repeatedly poured bowls of water over me and everything else until all was sud-free. This was quite hypnotic to watch. I sat down on the heated hammam bench so that Hatice could wash my hair. There is something very childlike about sitting nearly naked having your hair washed. Hatice added more and more water to the shampoo until there were masses of suds. Abundant rinsing followed. Hatice asked me to take off my swimsuit (which really didn’t feel like a big deal by this point) wrapped me in towels and led me to a white leather booth in the adjoining ante-room. Hatice spread a towel over the banquette, asked me to lie down, and finished the treatment by rubbing aromatic Bali Massage Oil into my damp skin. Wrapped in a towel with wet hair, I met Kadek, my therapist for the Japanese Hanakasumi Ritual (50 minutes, £35). Kadek led me through the candle-lit therapy room corridor to the VIP treatment room. This had two treatment beds, a mezzanine floor with loungers, and a large round bath. The whole room was lit only by candles and had red rose petals scattered everywhere. What a beautiful surprise. Kadek asked me to lie face down on the bed. I indicated that I had nothing on under my towel but she seemed unconcerned. I climbed onto the quite high couch with as much modesty as I could muster under the circumstances. My view through the breathing hole was a flower floating in water, lit by a candle from underneath. The Hanakasumi treatment is based on a Sothys product of the same name, made from Japanese cherry blossom and ground rice, designed to exfoliate the skin. Kadek spread the Hanakasumi paste over one of my legs and rubbed quite vigorously with a loofah. She then rubbed shea oil into my leg and foot. Kadek used her thumbs and knuckles to press deeply into tight muscles. Kadek then repeated this process on my other leg and removed the excess oil with a towel before working on my back. Kadek applied the Hanakasumi paste to each part of my body before massaging. 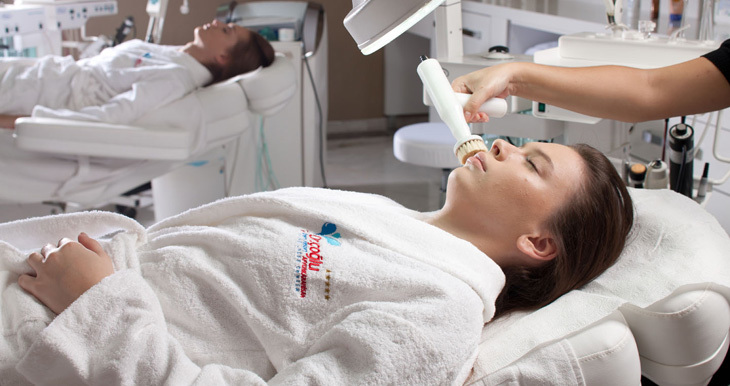 The treatment ended with a wonderful face, neck and scalp massage. Try these treatments if: You need to feel squeaky clean, like a Number 9 dream, and as fragrant as cherry blossom.